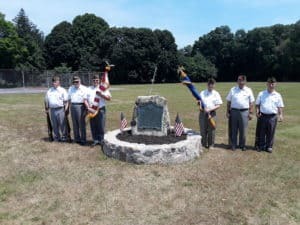 On Sunday, July 1st 2018, the Unionville World War 1 monument was re-dedicated at the Unionville Playground on Washington Street. 2018 is the 100th anniversary of the end of WWI. 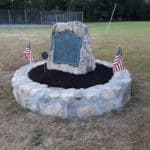 Numerous Easton Lions, Easton Selectmen, and area residents came by to watch the re-dedication. 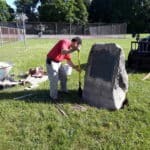 This Easton Lions project was chaired by Scot Kudcey and was supported by the Board of Directors and the general membership. 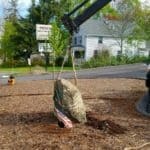 The monument was moved because it was not getting due respect at its previous location and could potentially have been damaged or destroyed in a car accident or by an errant snowplow. 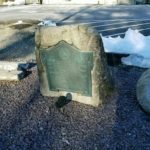 Ed Hands – who worked with the Easton Historical Commission and provided research on the history of the monument. 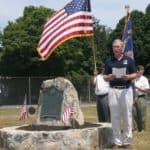 Scot would also like to thank Doug Springhetti of Springhetti Masonry for donating his services to build the new base around the monument, Commander Al Smart and the VFW Post 2547 Color Guard, Town Administrator Connor Reed, the Easton DPW, Timothy Hurley and the Easton Historical Commission, Cory Ahonen of the Easton Veteran’s Office, and Easton Smiles Dental Office (where the monument was previously located).